When one develops a passion for a sport, a parent's advice is usually, "Keep at it." 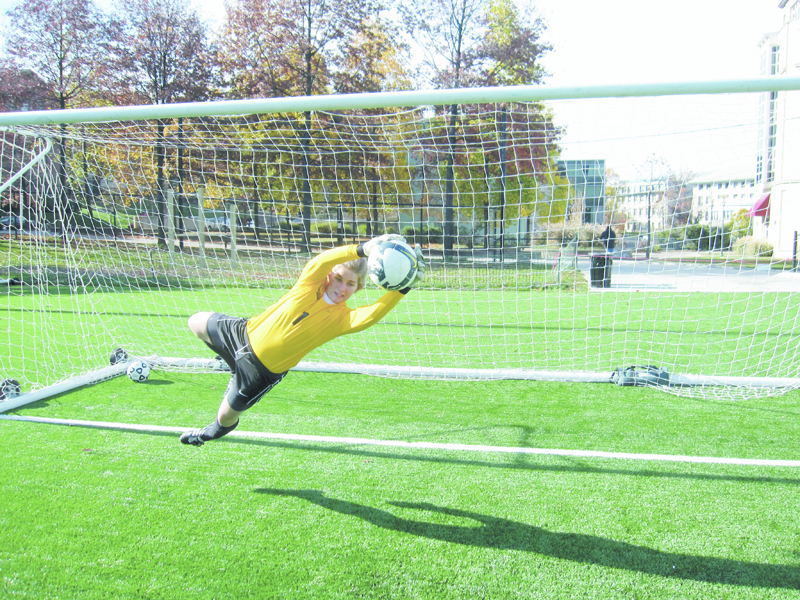 The Tartans' Anya Rosen has been keeping at it for 15 years now as she completes her final year at Carnegie Mellon as a fine arts major and goalie for the women's soccer team. "I started playing soccer when I was six or seven, but I didn't start seriously playing goalkeeper until I was in seventh grade," the senior from La Cañada, Calif., explained. "In middle school, the coaches noticed that I liked falling a lot, and they thought it would be better for me to be in the goal because you can fall there more than on the field. I was good [at goalie], so that was where I stayed. "I like being aggressive; I don't know what it was about the falling, the giving all your effort in one fell swoop instead of little by little, but ... exerting that intense maximum amount of energy in that one moment was what I wanted to do," Rosen said. Carnegie Mellon was a top college choice for Rosen not only because of its reputation as a great arts school, but because she liked knowing that the soccer team was interested in her and wanted her to play. Rosen will graduate in May with a degree in fine arts, and her concentration and passion is painting. She aspires to have a career as an artist and is applying to residency programs in America — in locations including New York and California — as well as in locations around the world, including Canada, Japan, and Argentina. Rosen said that, while she isn't fluent in any foreign languages, she knows some Spanish and spoke Japanese as a child. She lived in Japan while she was about six months to two years old. Rosen and the rest of the women's soccer team, which finished their season 8–8 with an overtime loss to Emory on Sunday, began the year with a new head coach in Yon Struble. Rosen believes that the family-driven philosophy that Struble brings to the team is essential to the growth and success of the team in the coming years. She also values that Struble is a former goalkeeper himself, and Rosen says she feels that every day she learns something new from him. As passionate as Rosen is for the sport of soccer as a student athlete, she doesn't envision herself continuing to play much once she leaves Carnegie Mellon. "I don't know how involved I'm going to be," she said. "With soccer, a lot of it is that I have a love for this intense competition. I'm sure I'll play with my friends, but especially being a goalkeeper, [rec league games] are not as exciting as practice, which is what I enjoy so much about soccer: playing, jumping around, being involved, and getting better every day."